The Hummingbirds Are Coming… Early! Last night at our local wetlands, I ran into a friend who mentioned seeing a ruby-throated hummingbird in his yard — a bit early! And this morning, Michelle from Rambling Woods posted on the topic. Since they’ve hit the Gulf Coast states a wee bit ahead of their migratory schedule, let’s help them REFUEL on their non-stop 500-mile journey! I’ll be getting the feeder ready for these lovely guys ASAP — habitat loss and destruction are the hummingbird’s main threats today, but changing temperatures are also affecting their migratory patterns, making it harder for them to find food. Learn more at Annenberg’s “Journey North” website — track the hummingbirds, learn how to help, and take a peek at the updated migration maps! 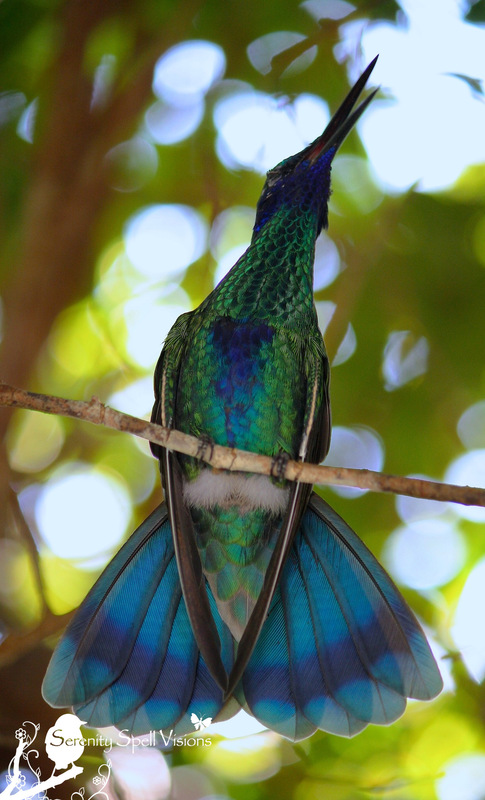 Sparkling violet ear hummingbird: Not in my yard, but at Butterfly World, the largest free-flight hummingbird aviary in the US. A most amazing, beautiful, and fairy-like place! Love bummers. You are a wealth of animal info. Thanks. Hee, bummers! (Or maybe hummers?) Thanks so much — I just wish I could enjoy these lovelies’ company more often! Fun facts, FeyGirl. We have a feeder just outside our dining room. Much better entertainment than TV. Ah, yay!! You’re helping these guys!!! I wish we had more of them, but we don’t. I’m still getting a feeder set up, since they’ve been spotted on this early migration! They need all the help we can offer….. Thanks so much for sharing these little lovelies!! Everyone who can help them on their journey, please….! It’s always such a delight to see a hummingbird. We have a new resident species in the Pacific Northwest – the Anna’s, which used to be a more southern species. I’ve read it might be due to climate change, but I don’t think anyone is sure yet. Our traditional resident is the rufous hummer, a real beauty. In the forest, I always hear them before I see them…that little motor sound of their wings. As always…your photos are amazing! Thanks! Ah, interesting!! It will be neat to see what the experts come up with, why this new species is so far north… But it sure seems as though it may have to do with climate change. Sadly, I don’t see them much here — SUCH a rarity, which is why I’m going to ensure that a feeder is out for their migration, since someone DID see one in their yard already! Poor guys. They have so much to contend with…. Great photo to go with your fun facts. Keep your camera humming when they show up! Love the hummingbirds! Always saw them in California, and hoping to finally see one here in Florida. I know!! My family in Marin ALWAYS has them, but here, alas…. 😦 But like I said, they’ve already been spotted down in our area, on this early migration. So I’m getting a feeder ready, just in case!! These guys need ALL the help they can get. We always look forward to a few flying jewels in the yard! Nice post with cool facts! I wish I saw them more down here — but I have faith, now, since a friend saw one with this early migration! Getting a feeder ready to do my bit to help them…. They need ALL the help + fuel they can get! Beautiful shot. We have so many here, and it’s a challenge to shoot them while flying!!! Thanks so much! Ah, I knew you would be surrounded by them!! With a new hummer feeder season starting up, it’s a good time to remind everyone that red dye is not only unnecessary, but some red dyes are also harmful to the birds. If you don’t know with certainty that the red dye you are using is safe, just keep it out of the mix! THANK YOU! Valuable info. WHY ADD dangerous dye to the very birds you’re trying to help? Sheesh!! It’s an old habit. People believe that the red attracts the hummers, it can, but is not essential. Hummers are quite inquisitive and will find a food source without the color. Some pre-mixes are ok in the red, but still the dye is superfluous. When in doubt, leave it out. We have Anna’s Hummingbirds in the NW year-round now and they’ve started pairing up already. We are still waiting for our migrant species though; I’ll keep my eyes peeled for them now! I really appreciate the info…. Since I don’t usually see them, I don’t have a feeder. But I’ll be setting one up in the next day or two, for these early migrating hummers! Fun post! I love the hummingbirds… Here in southern AZ I’ve had feeders up all winter. Only in the last week has the activity decreased. Maybe they’re also beginning to head north. Beautiful hummingbird you captured in your photo! Thanks so much — even though I don’t get to see them often, we ARE in the path of their migration, so hopefully my feeder will help ’em out. 500 miles of straight flying. Just amazing for these diminutive guys! Amazing hummer and excellent info! So exciting the hummingbirds are heading our way! One of my friends have had two hummingbirds all winter and set up a weather protected area for their feeder, including swapping out feeders before they freeze. Nice guy huh? Omigosh, that’s SO WONDERFUL! Yayayayay!!! What a sweetheart. Warms the heart to think of such people…. I’m getting my feeder today, since the first guys have been spotted here (although I’ve never had the luck to see one!). Great shots! I have been wanting to contact you about your Anoles of the Rainbow blog. I am a photographer and serious reptile keeper. I would love to photograph some of these color morphs. Please E-mail me @: morelia236@gmail.com, I would love to ask you a few questions about the Anoles. I love hummers! Excellent post! Thanks so very much! They’re such amazing little creatures…. That’s an amazing picture! And I love the facts. I will make an effort to regularly refill my feeders now. And… YAY for you! More help to these wonderful critters — they really do rely on what we can provide, since their food sources have been seriously cut at our hands. Do you know, a photog friend of mine and fellow blogger commented on this post with a similar story! She lives in MD… She describes a pair of hummers who stayed through the winter, and a kindly neighbor ensured a full, unfrozen feeder full of nectar (swapping out feeders) for them! Isn’t that just wonderful?? Wow wow wow – this is an amazing shot! So beautiful. When I lived in Colorado and fished in the mountains I have a special memory of taking a nap in my red baseball cap and waking up to a furious buzzing around my head….a hummingbird mistaking my hat for a feeder LOL. sharing this with a friend of mine who loves to photograph hummers. p.s. I just visited your site, and I must say — I would love, love, LOVE to live in your cottage! Talk about a dream-come-true. Thanks so very much for your kind words…. It was a REALLY lucky shot — I felt like a bit of a stalker, trying to avoid the tree branches. 🙂 I just wish we had them more down in our neck of the woods — but at least the northerners will soon be enjoying their lovely presence. I definitely learned a bit about these amazing creatures too, in my research…. Truly phenomenal, when you think about it. I hope your son enjoys!! It’s so good to see you back; I haven’t seen your posts for a bit! Wow, first of all because you captured such a great picture and second – oh , what interesting information on the humming bird!!! Thank you very much!!! It was a lucky shot, truly…. I didn’t even see him at first, he was so well hidden in the tree branches! He’s just amazing. THEY’RE such amazing creatures…. your photo is stunning, and the facts are great. thank you for a great read! What a beauty. Thanks for sharing. Thanks Hanneke!! Aren’t they the most amazing little creatures!? And if you have lots of patience and really want to get up-close and personal to these beauties, there’s always this! . Oh, my little jeweled birds! They really do look like little jewels, don’t they? Better than any jewel humans can create. So completely true…. And yet, we’ll sure try, won’t we? I wish I had seen them in my area… But I didn’t! I hope you get to see them – and have feeders to help them!